If yo u’ve ever had to do a personality test (Myers Briggs etc) then you’ll know that they can sometimes have unexpected consequences. It’s time to throw out the old for something new. And that something new (in my opinion) is this new online test (and matching book) – the fascination advantage. It’s designed by Sally Hogshead (advertising/marketing expert, among other talents) and she’s designed it as a personality test based on the seven different ways to fascinate. The best thing about this test is #no one loses. Every type that you can get sounds well.. fascinating! 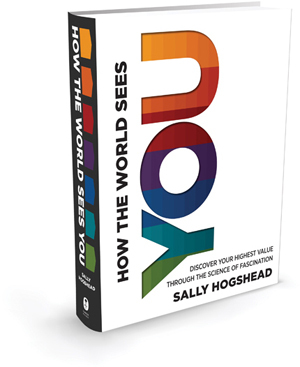 The online test that accompanies the book produces you an advantage report based on ‘how the world sees you’ (key difference: not how you see yourself). It goes through your two most dormant fascination advantages which combine to produce your ‘type’. The report in itself is really quite cool and rather than attempt to describe the whole thing, I’ll just share mine here. What I love about the book (and test) is that it focuses on uncovering your strengths, on you becoming more of who you really are… it’s a marked difference from how other tests can make you feel (e.g. I got high in extroversion that means I need to be quieter, talk less etc). This is a great book/test for developing your (dare I say it) ‘personal brand’. It’s also interesting to get those close to you (partners, colleagues) to do the test and see how you all match up. In the book Sally gets into how you can use this type of testing to assemble better teams. For example put together a team made entirely of the ‘passion’ advantage and you’ll get a lot of loud ideas but perhaps not much done! You need variety and a mix. Check out Sally’s website and test here. *You don’t need the book to do the test, you can go straight to this site (the book just provides more explanation/detail). *If you’re going to get the book I’d recommend a hard copy – it’s much easier to flick back and forwards between the types and the descriptions.